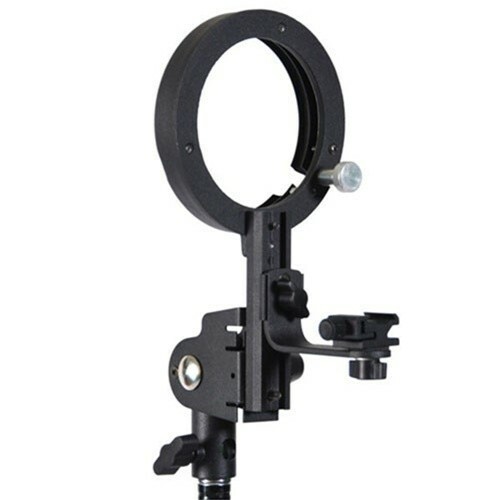 Made out of high quality metal, this bracket lets you use your hot shoe mountable flash with a softbox. The tilting mount works on standard lightstands. The hot shoe mount is adjustable vertically and horizontally. This is off camera flash mount adapter with cold shoe. This flash adapter will fit any Bowen, Calumet and Travelite softbox you have already. It will turn your exiting Calumet, Travelite or Bowen mount softbox into the off camera flash photography. It comes with the ring, hot shoe mount for your Nikon /Canon or any hammer type flash and attachment mount to go on light stand. Will not fit SONY. Specification: - Ring Diameter: 4"